Built in 1911 by CPR’s Angus Shop as Suburban coach number 181, it is 72’11” in length, with truss rods and four-wheel trucks. 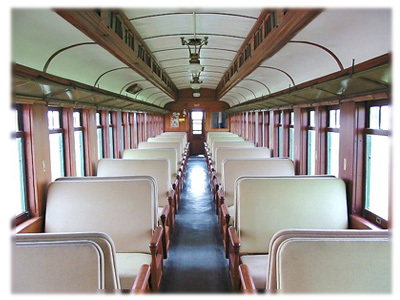 It has a capacity of 72 passengers, mahogany and oak paneling, and full-length brass luggage racks. Like 104, it still carries its original Pintsch gas light fixtures. Along with 106, 107 was sold to the GWWD in 1956 to bear the number 55 and later 355. It was traded to the PDC in 1970, entering service in 1972. Between 1911 and 1913 Angus Shops built a fleet of 175 almost identical wooden coaches designated ‘Suburban’ for use on short-run local trains out of major centers across the system. Some were used in the Montreal commuter fleet, while others went to cities from coast to coast. Coach 180 was photographed in Vancouver and, from an inspection ticket found inside the coach, 181 was last serviced by CPR in 1951 at Ogden Shops, Calgary. CPR’s Official Registry for 1949 shows 230 wooden suburban coaches in service but by 1960 it records only six. Today coach 107 is the only known survivor. Interestingly the 1949 Registry also records that, of the 230 suburban coaches, only 34 were equipped with electric lights, all the rest had Pintsch gas lights. Alas, these lights played a major role in the death toll in Canada’s worst train wreck on the CNR at Dugald, Manitoba in September 1947. In that head-on collision, the gas light in the wooden coaches of a camper special ignited almost the whole train.